When the wind comes sweeping down the plains in our area – it comes in the form of 50mph GUSTS…not the gentle breeze you’d hope for. 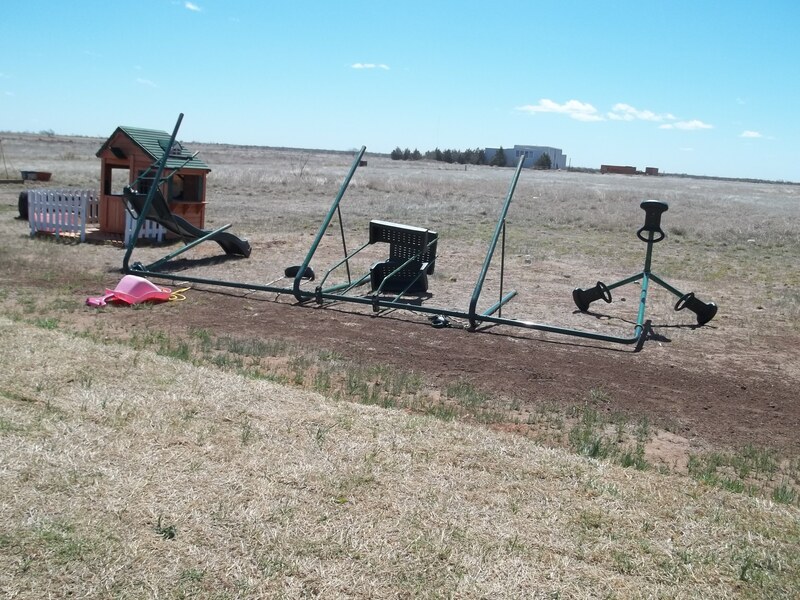 Over the weekend, our lovely wind successfully managed to topple over the big swing set (snapping the chains on the swings), ripping our newspaper box – BOLTS AND ALL – and I’m sure someone in Texas is reading our paper today – or at least parts of it! So what can you do around the yard in weather like this??? Well, pick one day and completely overhaul your garage from top to bottom with a good spring cleaning and get organized!!! Did that! Yay! 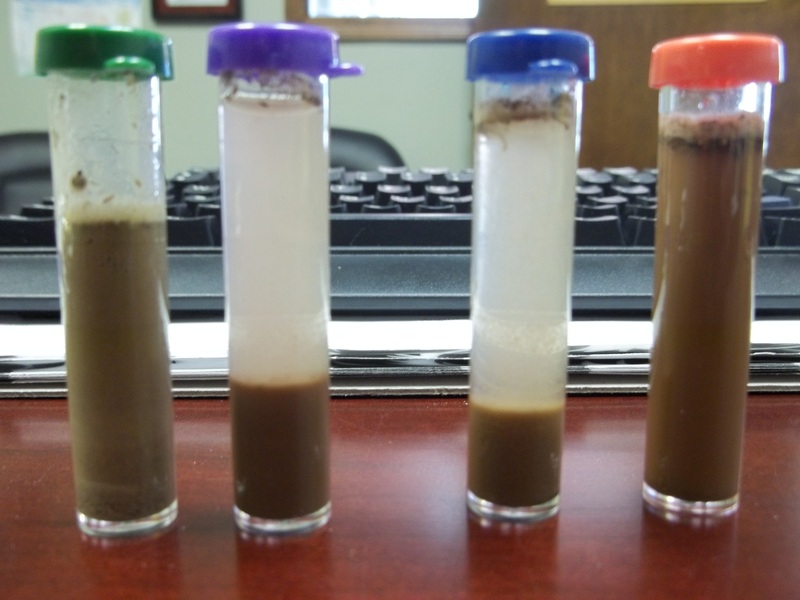 Secondly, do some soil testing if you’re planning on starting a new garden bed. While the weather was still ‘calm enough ‘ (aka 20mph wind) my hubby and I were admiring the growth of the raised garden beds and he put in his ‘order’ for summer fruits and veggies. Of course his list didn’t quite match up with mine so adjustments are in the works. He wanted some sweet corn (which I personally think would grow better in a traditional, larger garden; he asked for lots of cantaloupe and watermelons – both of which will require more room than what I had alloted in the raised beds. So, he mapped out about a 200 sf area for a new garden. The bed of course is made of pure concrete like dirt. The proposed new area for the traditional garden. Watering has already started just to soften the ground enough to till it! 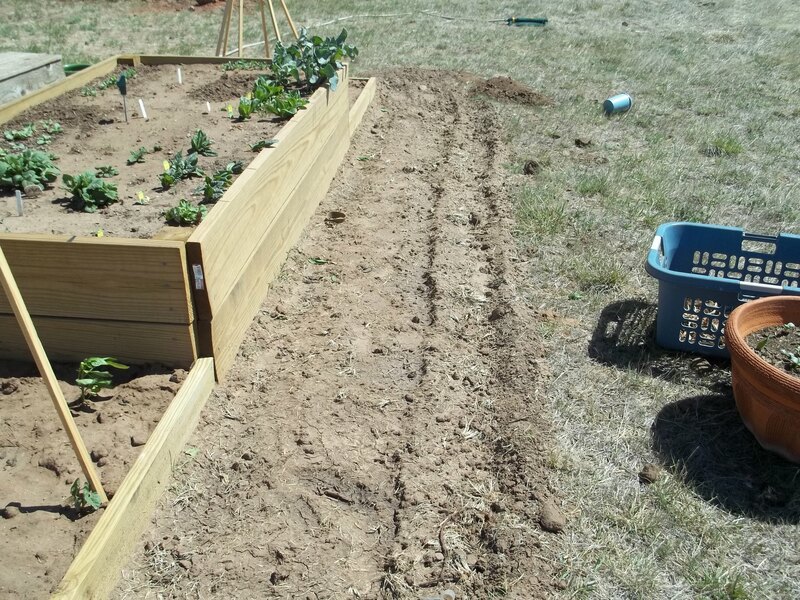 I took the roto-tiller to the first section – which will serve as where I plant things like our additional cucumbers and maybe a few melons. 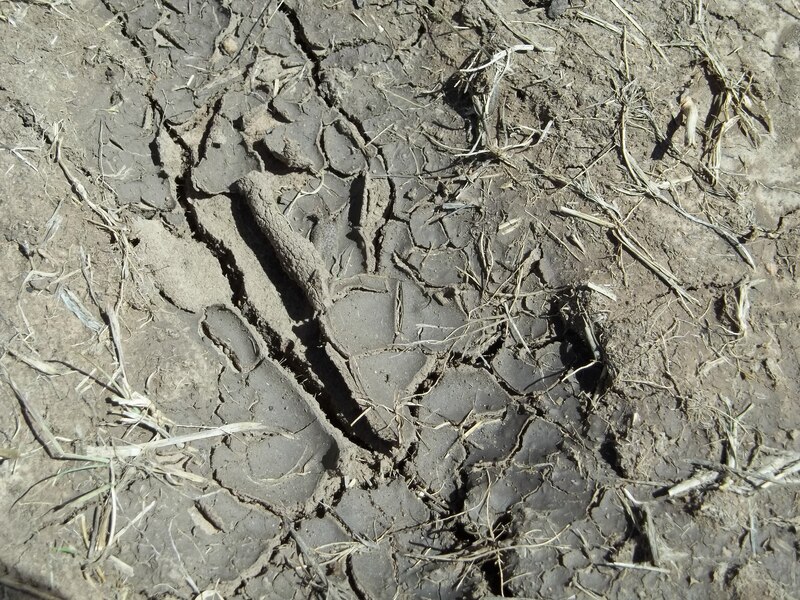 Since we’ve had next to zero precipitation in going on 5 months – I tilled up lots of dust – which you don’t really want to do, but I wanted to get a good feel for what I was going to be working with. I sprayed the area pretty well with the hose first so that we didn’t knock up too much dirt, but that stuff is DRY, DRY, DRY! While you can get yourself a good sample of your dirt and take it to your local county extension office and get a detailed health report of your soil – I know mine is bad. I went to a local store and purchased a couple of soil test kits for under $4 that will give me a ‘summary’ type report. You know you have terrible soil when the color strips don’t even come CLOSE to registering on the scale…so that means lots and lots of work for Wendy in the next few weeks. amending and fixing your soil will take a lot of time and immediate results are not forthcoming; but the best thing you can start adding – compost, compost, compost! 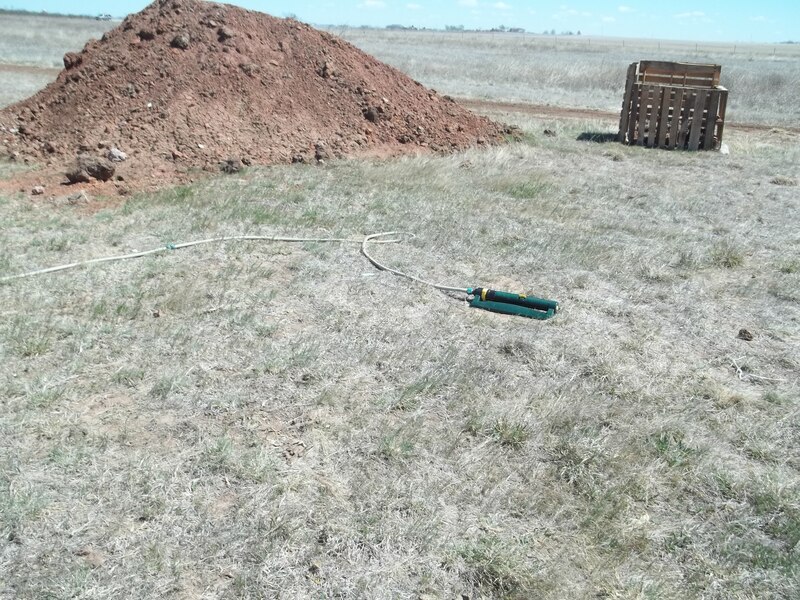 Then depending on the pH level – gypsum or lime, look at the nutrient content of your soil – mine scored next to nothing. Had it been in my husband’s history class – it would have flunked miserably. No matter what your soil nutrient content, you’ll want to add amendments whether organic or chemical according to the package directions. Also – don’t try to do ANY of the amending in 50mph wind. Use this as the time to figure out what you need and how much of it you need – then wait a few minutes if you’re in good ‘ole Oklahoma – then start your project! This entry was posted in Soil Amendments, Starting a New Garden Bed. Bookmark the permalink. 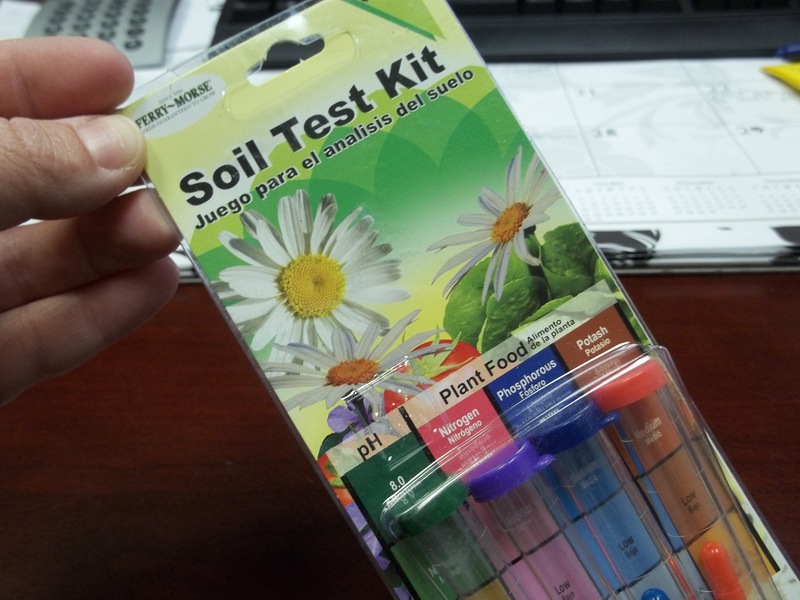 Have you had much luck with the store-bought soil test kits? My local extension agent never has anything nice to say about them. Yes, I’ve had fairly good luck – but of course I know that I’m not getting the full on ‘detailed’ version, but as a quick overall health report – they at least give me a good foundation on which to start. In my particular case, I know the soil has had decades of neglect, wind errosion and is packed hard as a rock due to the heavy amounts of clay. I purchased the cheaper kits to at least get me started as to where I need to be and in which direction to go. (Alkaline vs Acidic) and they’ve provided me with some key highlights as to where my nutrient level is. I liken it to using cliff notes for a book report versus really READING the book; you’re going to get a good idea of what the story’s about, but you’ll never fully appreciate the book itself until you actually read it. Also, the soil, since a lot of dirt was just brought in to build the new house, is very different than the native soil surrounding the house. I’m frugal at times and would rather do a few $4 tests for soil from each side of the house (because yes, ours does vary that much here) than invest $100 for the same extension tests…Let me get it to a point where I know I can work from and THEN I’ll invest a little more to fine tune everything.